Thanksgiving desserts typically are full of pies in every variety, including pumpkin, apple and mince. 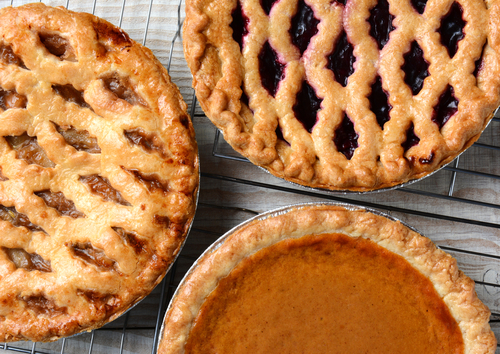 Luckily for us here in South Orange, our area is full of tasty pie shops, which will certainly come in handy after you’ve already spent hours cooking Thanksgiving dinner! Cait & Abby’s Daily Bread, located at 15 Sloan St, South Orange which is a five minute walk from your Third and Valley apartment, has worked to provide their customers with homemade baked goods and a friendly atmosphere for more than 20 years. If you’re looking for some tasty pies, Cait & Abby’s Daily Bread offers them in varieties of apple, cherry, blueberry, pecan and even key lime if your guests are feeling especially tropical on Thanksgiving Day! The Pie Store, located at 100 Watchung Ave, Montclair which is about 20 minutes from your Third and Valley apartment, is a bakery specializing in savory and sweet British pies, as well as groceries imported from the U.K. These pies are moist, flaky and have delicious crusts stuffed with flavorful fillings like chana masala, steak and mushroom and chicken curry. Plus, large and small sizes are available which gives you the option to share different fillings and styles.